Mira, Evo, Kat and Tim at the Kid's Chalk Art Project at Alameda Point. The KIDS' CHALK ART PROJECT is a community event that celebrates and supports the creative spirit of our children. 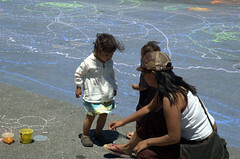 The Project's goal is to collaboratively create the World's Largest Chalk Drawing with the kids of Alameda (K-12), their families, friends, and neighbors, as well as the greater community of the San Francisco Bay Area. We will continue to "Re-Enchanting the World Through Art" with our mission of supporting and inspiring kid's creativity and imagination locally, and around the World.